From 1 January 2014, the R&D quarterly credits regime will be a new option for small cash-strapped companies wishing to claim under the R&D tax incentive. On Monday, Treasury released its proposed workings of the regime. 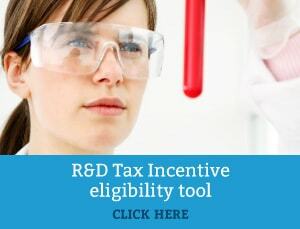 It will allow companies eligible for the R&D refundable tax offset to obtain the benefit of the offset on a quarterly basis during an income year, rather than waiting until an income tax return is assessed. Are you eligible for quarterly credits? 2. 25% of the refund from all its refundable tax offsets that was assessed to the entity for that year. The ‘safe habour’ will apply under this approach as the refund the entity got for the same offset in the previous year will be assumed to be a sufficiently reliable predictor of what it will get in that same period of the current year. Subject to certain exclusions, an entity may claim under the Variable Amount method at the taxpayers discretion. On conclusion of the income year, any overpaid or ‘negative varied amounts’ are to be repaid to the ATO with general interest. The Commissioner may disallow ‘front load’ amounts, a process where an entity overpays itself in the first quarter and artificially deflates the Variable Amount in each of the subsequent quarters with a view to converge on the correct amount of entitlement. The tax office will issue an advance payment where, for that quarter, the entity had a Positive Variable Amount or where it nominated the Standard Amount. The ATO will credit the entity interest on late payments. When do I have to repay an overpaid amount? At the end of the year at the time of assessment, each payment will be added and reconciled with that years actual R&D tax refund. At this time, where the entity has been overpaid any amounts, those amounts will be repaid with interest. Conversely, where an amount is due to be payed by the ATO, that amount will be paid as if it was a normal offset. If you would like more information on this regime or would like us to work with you on a submission, please do not hesitate contact us.